Dr. Ganea is board certified by the American Board of Pediatrics. She received a bachelor of science degree in biology with honors from Trinity College in Hartford, CT. She was awarded her medical degree from the Albert Einstein College of Medicine, followed by an internship and residency in the Department of Pediatrics at Montefiore Medical Center. Most recently, she was a primary care pediatrician with Pelham Pediatrics for the past nine years, where she provided comprehensive care for patients from newborn to age 21. Prior to that, she worked as a pediatrician with the Segunda Ruiz Belvis Diagnostic and Treatment Center in the Bronx for over seven years. In addition to direct patient care, Dr. Ganea has also taught and supervised medical students, physician assistant and nurse practitioner students. 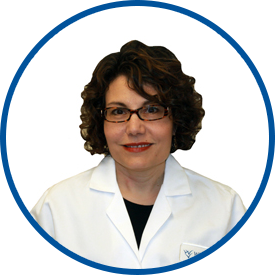 Dr. Ganea enjoys reading and spending time with her three children, one 13 years of age and twin 10 year olds. She has communication skills in Spanish. we love her. she is amazing with our daughters and very helpful! whenever I email she gets back to me right away with help!! The Dr. was great. She took the time to answer and hear all questios. Sandra was very sweet and thorough. She not only asked for my concerns but also asked my child if she had anything she wanted to express.